As expected, as oil prices soar, and the oil price bulls stampede with joyful abandon, the IEA dumps its cold water harbinger of the coming oil price roller coaster. Remember that I have kept commenting that I would be happy if oil prices averaged $65 this year? And that I would be happy if oil prices averaged $70 in 2019? There is a reason for that. (Note that I view the value of the U.S. Dollar should decrease a bit by the end of this year, as the PetroYuan starts taking hold as a viable alternative to the PetroDollar. So I've actually been hoping for $65 oil for the next 2 years.) Anyway, flying in the face of the exceedingly hopeful and optimistic predictions of global oil demand increases, the IEA has come up with a revised scenario for global oil price demand. Simply, higher oil prices should reduce global oil demand. And ... (this is the harbinger foreshadowing bit) as global oil demand diminishes due to too high oil prices, oil prices will fall again. Yippee, let's all hop on the oil price roller coaster yet again (that's tongue in cheek, BTW). So, while the oil bulls are merrily stampeding, my view is the higher that oil prices go above $70 or so, the bigger the resulting oil price crash will be. Anyway, here's The Tylers' latest update: IEA Cuts 2018 Oil Demand Forecast On Soaring Oil Prices "... 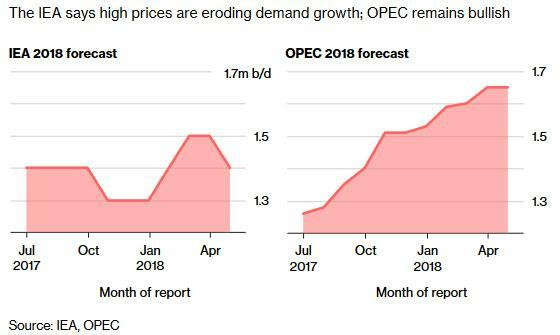 The IEA said that while the global economy remains robust (if clearly topping over), oil prices have surged about 75% since last June, and “it would be extraordinary if such a large jump did not affect demand growth,” the IEA said. The “effect of higher prices should in particular become apparent in gasoline demand in the next few months,” it said, confirming what we noted last month, namely that much of the Trump tax cut effect will soon be wiped out due to higher gas prices, putting further pressure on the US economy."